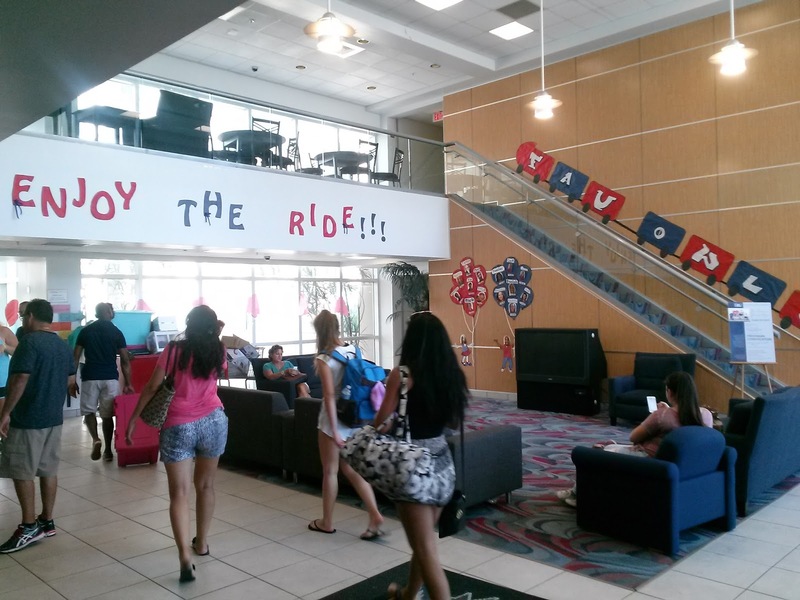 on Thursday FAU welcomed over 4,000 students back to campus, many for the very first time. They came from all over the place - west coast of Florida, north Florida, New Jersey, Ohio, you name it. 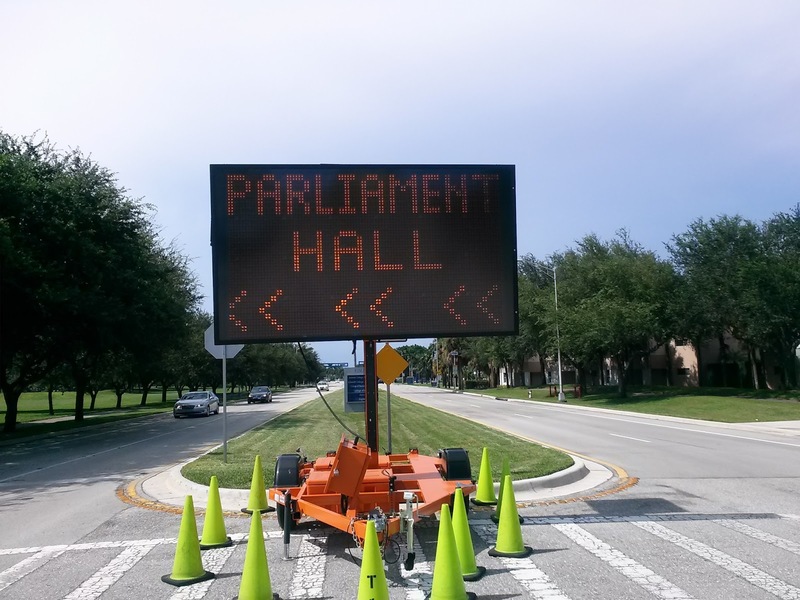 They had spent months posting pictures on Twitter and Instagram of the Glades Road entrance sign and a message that said, "Only ___ days until I move to Boca Raton!" with icons of sunglassed happy faces, palm trees and thumbs-up hands. They pinned up their airline tickets by their computer, bought mini-fridges and posters and new blankets months ahead of time… and then last minute hastily threw all their belongings into garbage bags with clothes hanger hooks peeking out the top and boxes with the description "stuff" a day before they were supposed to leave. New FAU freshman roll into town with their parents the night before and check into a local hotel. The next morning, depending on what building they're in and what floor, they are assigned a move-in time. The first ones are early in the morning… about 8 am if I remember correctly. Everybody piles in the car, hits up Dunkin Donuts on 20th Street, then heads to campus where they're met by campus police, traffic cones and entrance signs guiding lost parents to the respective dorms. The student and mom come back outside, both in a very good mood, and a sweaty irritated dad is unloading the possessions onto the sidewalk as expeditiously as possible and saying things like, "Come on they're honking at me I need to move let's go!" Because dads do that kind of stuff. 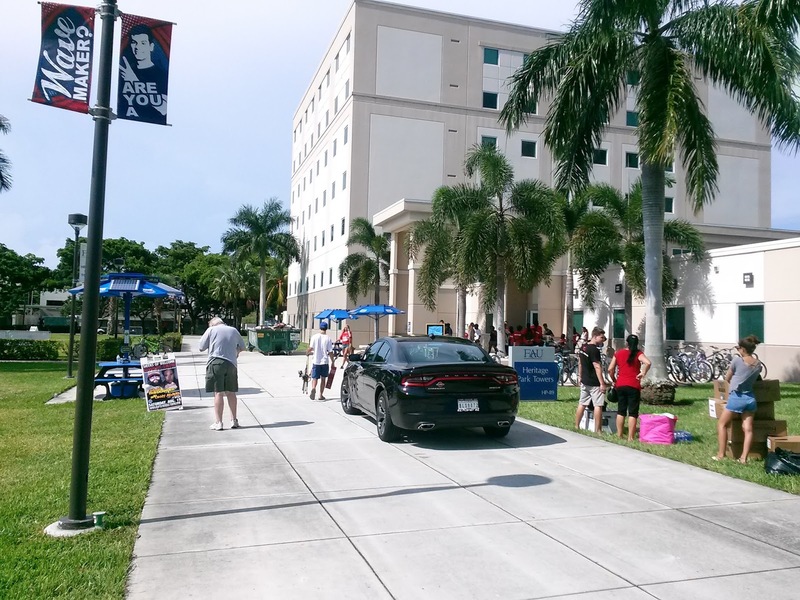 Fortunately the student volunteers - who used to be called FAU-Haul, now just called Move-In Crew because, you know, why not kill a clever idea? - come up, sometimes several at a time, with dollies and offer to help. The volunteers are typically students who traded the luxury of moving in a day early for their services and help out for about 4 hours (8-12 or 1-5). Otherwise it's student athletes or Greeks/student organizations promoting themselves by getting some face time in with new students, as well as people you might not expect to help out: President Brogan (I believe) started a tradition of helping on Move-in Day and it's something that President Kelly has continued! So once you get everything out of the car/moving truck, you head back into the lobby which has been decorated by the RAs. For instance, here is Parliament Hall (the newest dorm). Excellent job with the decorations. Then you're inside and a sizable chunk of Move-In Day is spent waiting on elevators, the main bottleneck in the whole process. Hundreds of people are moving in and there are usually only two elevators on each side so you spend a lot of time resting on boxes and sizing up other people's belongings (surfboard… nice) while Irritated Sweaty Dads defeatedly exchange Irritated Sweaty Dad glances at each other. If you were moving into IRT this Thursday, you would have been met with a train theme of sorts. Along the way you see flat screen TVs, fishing poles, big pink plastic storage bins, and anything else that Target had on sale. Unless they come in late, you'll bump into your roommate in the first one or two trips up to the room, and after a few pleasantries, you'll get back on the elevator and your mom will say, "Well, they seemed nice." Which is true, but everyone always seems nice in the beginning. You hope you're not that one college student who got stuck with a sociopath. Most people aren't. In a given 4 person dorm, one person is you, one person you can actually hang out with, one person is the weirdo and the other person you never see. Like, you're surprised when you come home one day and they're there. "Hey dudes, FYI, Dave is back." Anyway, back to Move-In Day. Eventually you get it all up there and start unpacking. Your parents offer to stay, though they know you don't really want them to, so they head back to the hotel for some pool time/shower. Maybe you make plans to eat at P.F. Chang's tomorrow before they head out. The dorm is empty now except for the kid moving in down the hall. You unpack for an hour or two, get the basic skeleton of the room in place, take a picture for social media saying something like, "All moved in my new dorm! 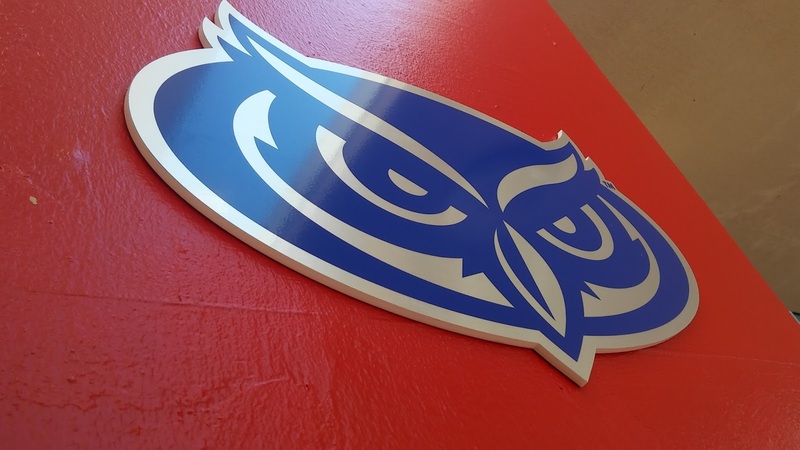 #collegeboy #goowls" and realize you want to get out and socialize. There's some event going on at the stadium so you head that way. 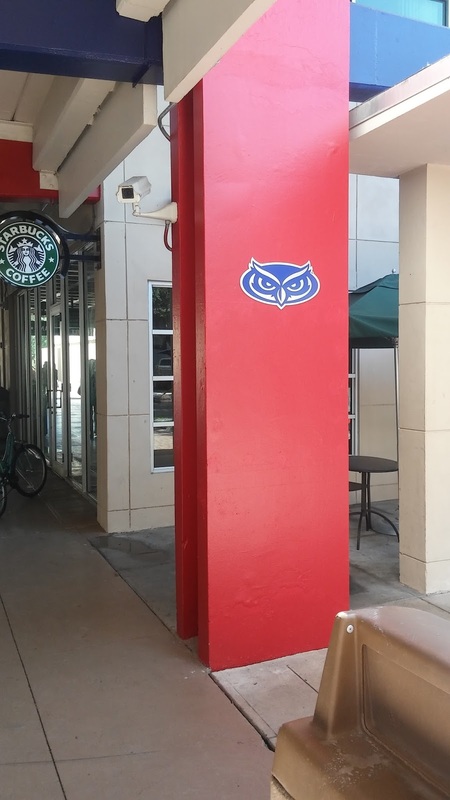 …new FAU owl head logos are up along the way! From a distance they look like they are just paper decorations hung up for Weeks of Welcome but no, they are actually about half an inch thick metal logos. Very nice work. 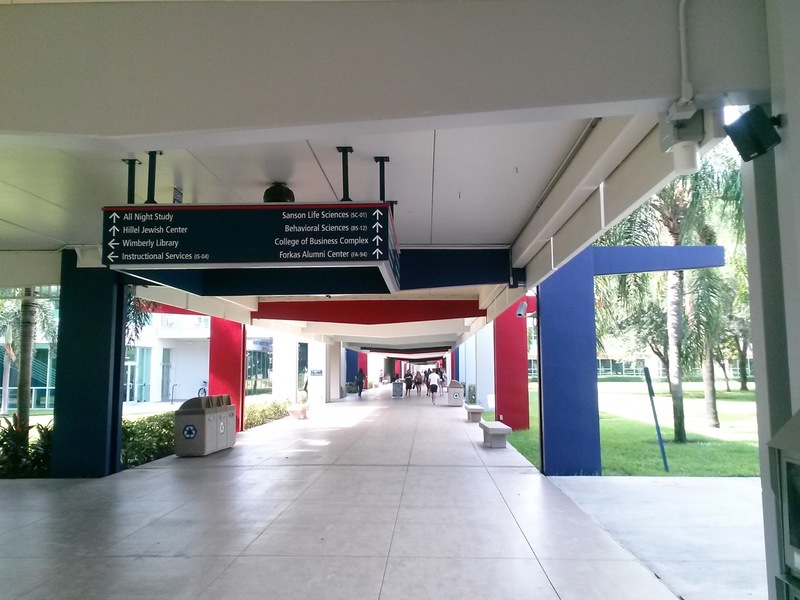 Also crazy that it took us this many Breezeway (re)paint jobs before this was implemented. 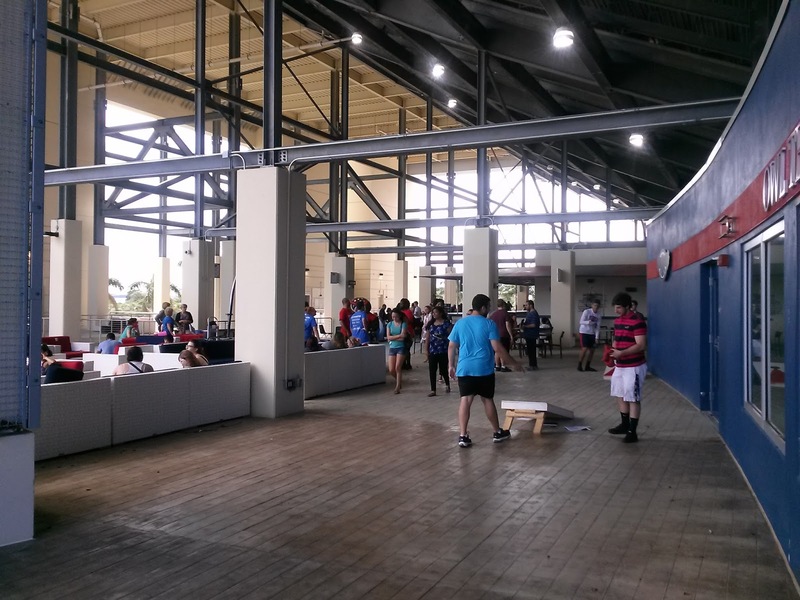 At the stadium the school had a Student Club Meet & Greet in the Delray Acura Club that drew a healthy turnout and about a dozen clubs. At this point you realize you've finally made it. College! It's going to be a great year! Congrats Class of 2019 - enjoy your time in Paradise! 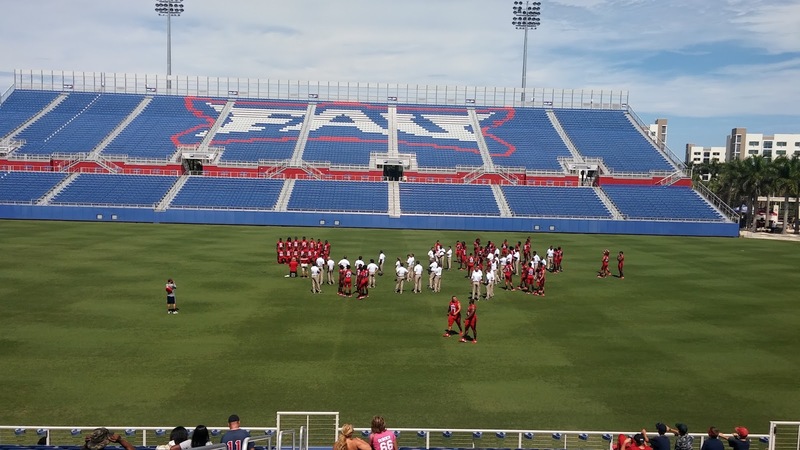 Now let's fast forward to today when Athletics held an event for FAU fans. 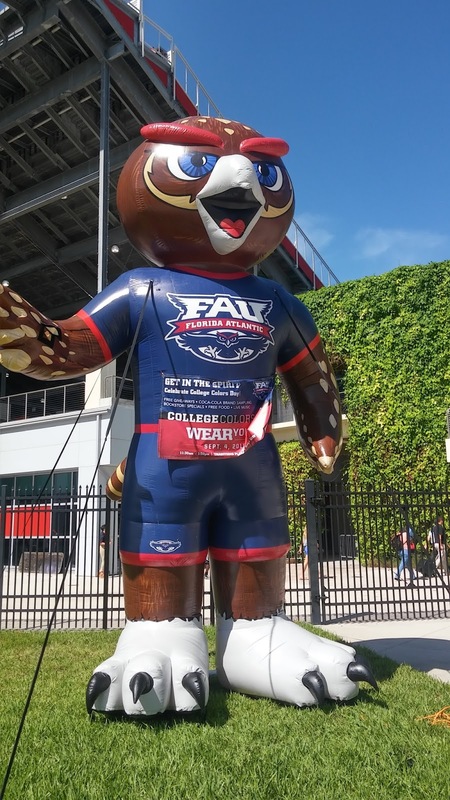 The giant inflatable Owlsley has been making his way around… he's been at every Move-in Day (Jupiter, Boca) and now he's here to welcome people to the event. He's about 15-20 feet tall by my estimation. 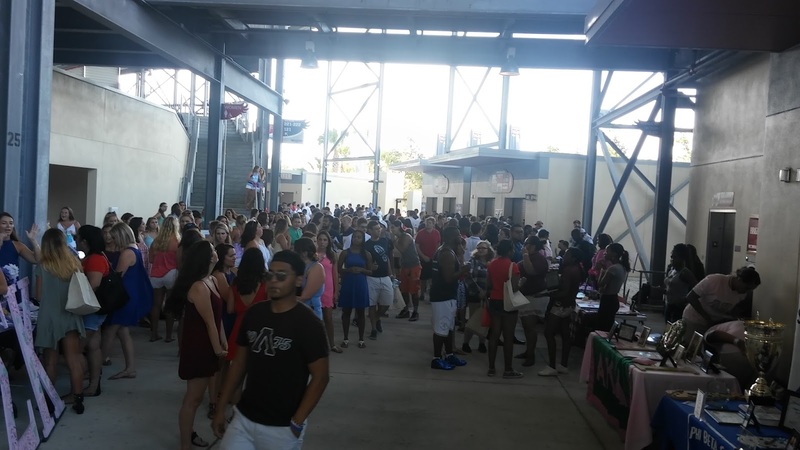 once you enter the stadium there were student organizations all over the concourse. Like 2/3rds of the way around the stadium. 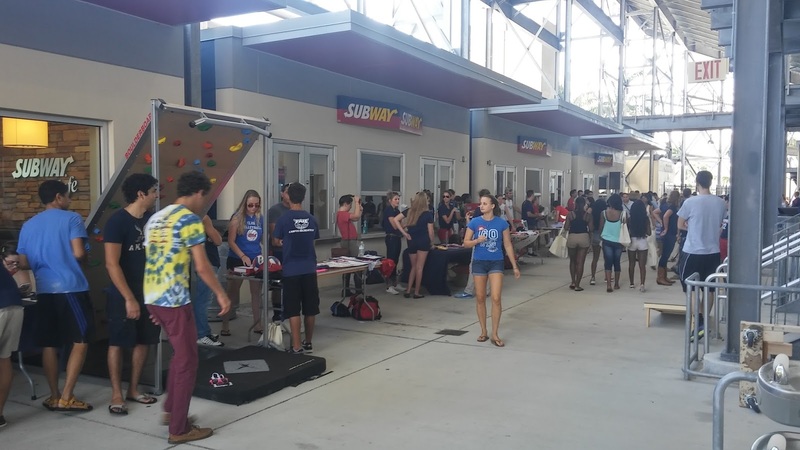 There are a LOT of student organizations, and many more than what was available for the Move-in Day event. The Greeks had the largest turnout, as you might imagine. 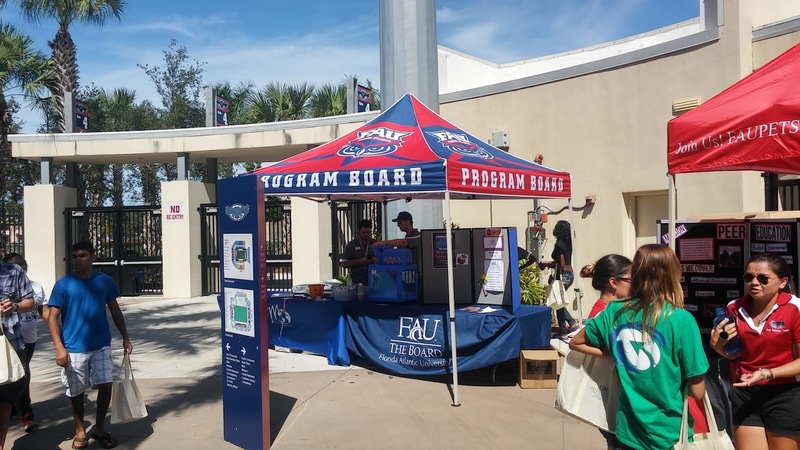 Program Board used to have a nondescript FAU blue tent. Their new(?) tent is a definite upgrade. The Intramural Clubs were out in force too. 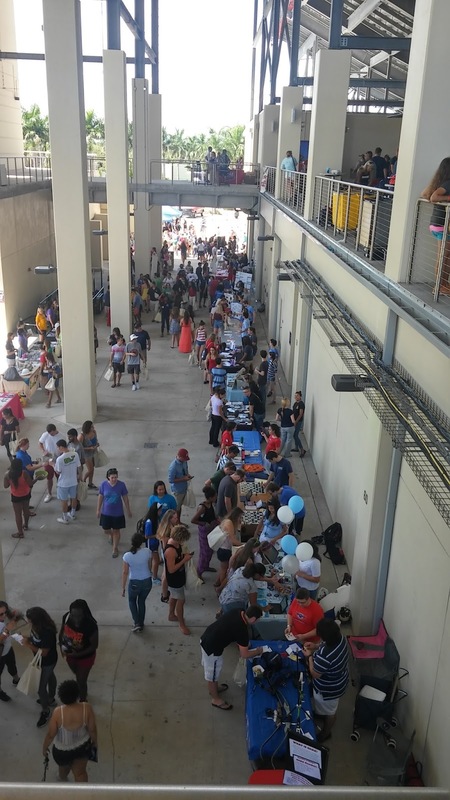 And here's an overhead shot of the academic clubs tabling on the west side of the stadium concourse. College Democrats, Geology Club, Pre-Physician's Assistants, the whole bit. 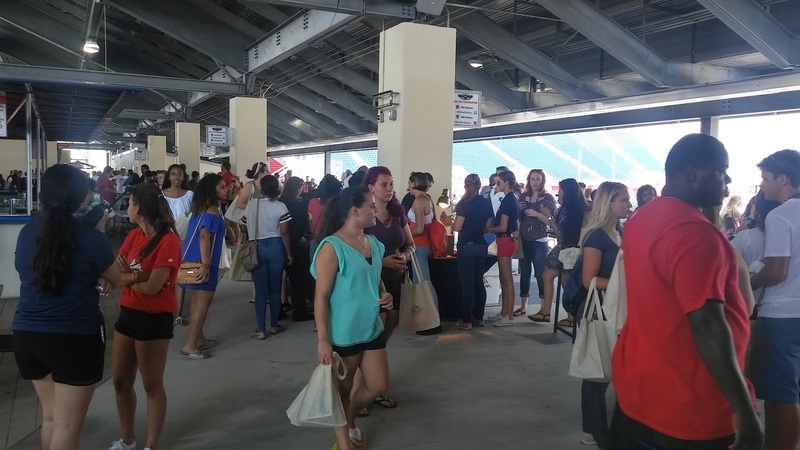 But it's upstairs in the Delray Acura Club where the action was… free food, coaches from all the sports, athletes, and more. The food was Nathan's hot dogs, some overly-chewy soft pretzels, nachos and Coke products. 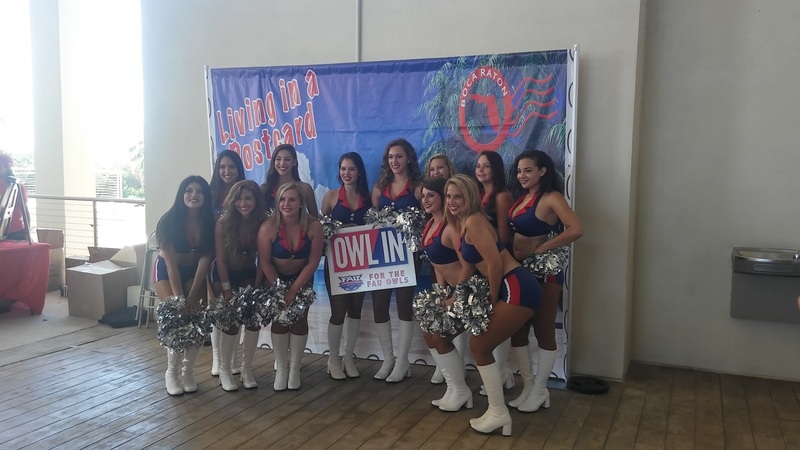 There were a couple of Photo Opportunities including this one of "Living In A Postcard", here modeled by the nationally-recognized FAU Dance Team. 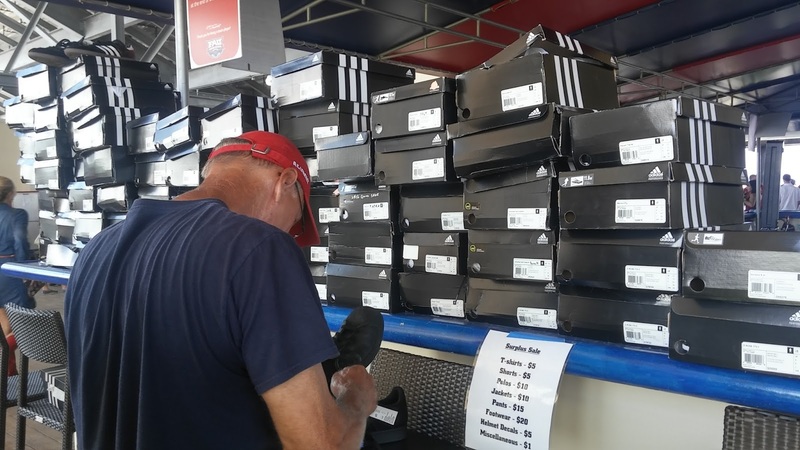 A surplus sale was held with used shoes, jerseys, polos, gym shorts, gloves, etc. I was actually a little surprised how popular this stuff was! 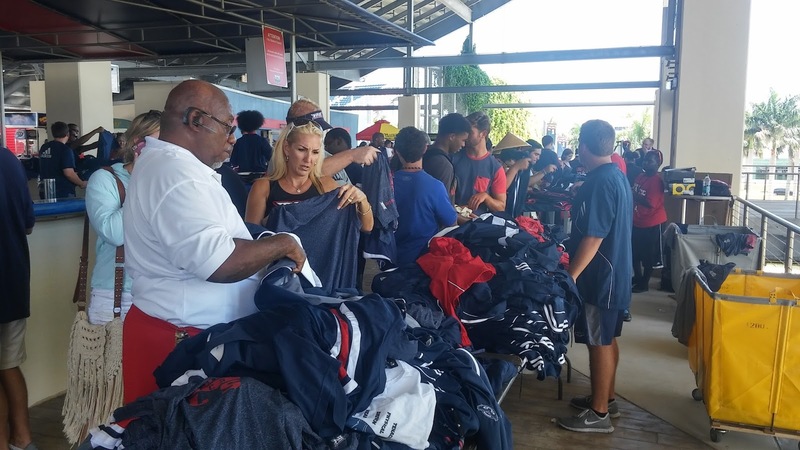 20 days until the first FAU football game of 2015! Are you ready?